Sold by : Reckitt Benckiser IndiaPvt. 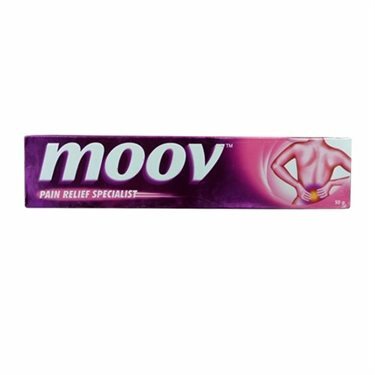 Ltd.
Moov Cream is a specialised ayurvedic pain relief topical ointment that relieves pain and inflammation in lower backache, upper back pain, spondylosis, arthritis, muscular strain, joint mobility, swollen tendon, muscule sprains, sports injury, knee pain, fibrositis and general body pain and aches caused due to stress, fatigue and strain. Moov Cream is made from wintergreen oil, pudina ke phool (mint leaves), tarpin ka tel (turpentine oil) and eucalyptus oil (nilgiri tel) which are all beneficial in providing instant pain relieving action. For external topical application use only. Consult your doctor if symptoms persist. Do not apply on skin cuts, open wounds, eyes, ears, nose or mouth. Keep away from children.